Your website forms a crucial part of your customer journey. The good thing is that your website stores a lot of data that could give you insights into your customers and their behavior. The question is, are you able to access and analyze this data and leverage it to make better-informed business decisions? 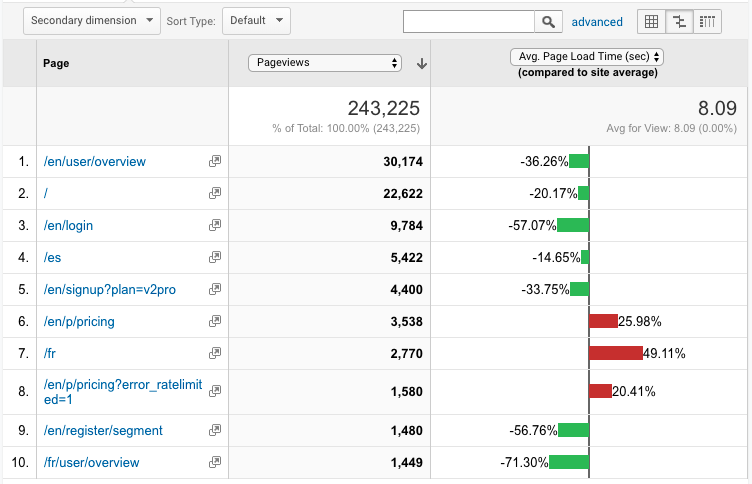 A tool like Google Analytics (GA) comes in handy. For the sake of simplicity, we will look at what analytics is as a concept as well as the Google Analytics tool, how it works, and why you need to incorporate it into your SEO efforts. While there are other analytic tools you can use, but Google Analytics is where you’ll get the most benefit for the lowest price tag (it’s free!) Plus, it integrates seamlessly with WooRank’s Projects and reporting tools. Analytics is the tracking and analysis of data to uncover meaningful patterns and using those patterns to inform better decision making. Analytics helps marketers and business owners determine the success of their campaigns, allocate future investments of time and resources and adjust their strategies. In the context of search engine optimization, analytics generally refers to using the data collected on your website to understand and optimize website usage and conversions. What kind of data are we referring to here? There is a lot of data that you can get from analytics. What we have mentioned here is just a fraction of it. Google Analytics works by installing a piece of special code in your website’s header. When someone visits your website, this code is activated and assigns that users a unique ID. Google Analytics then records the actions the user takes on your site and stores them with the user’s ID. Remember, all of this data is collected and stored using an anonymous user ID assigned by Google Analytics. No personally-identifiable data is collected or store. So using Google Analytics (or almost any other analytics solution, really) will be compliant with the EU’s General Data Protection Regulation, or GDPR. Why Use GA for Your SEO? Digital marketing is a highly data-driven field and it’s easy to become completely lost in all the spreadsheets while trying to find the right information you need. GA allows you to present your data in a simple, neat and understandable way. Google Analytics various dashboards and reports pull all sorts of different types of data into views that are easy to read, digest and share. The tool comes preloaded with the most popular and widely-used views. If you need more information or want to connect two existing reports, you can easily create custom reports and dashboards to slice and dice data to fit your needs. We’ll provide you with some resources on doing this at the end of this guide. Analytics such as racking user flows, conversion rates and traffic sources is vital to understanding when and where things on your site go wrong. After all, if something on your site is driving users away, that’s a big problem. However, just as important, Google Analytics can show you where things are going well. If you make a change that results in more engagement, higher conversion rates or more traffic, you need to see that so you can test it out on other pages. Remember, SEO is as much about doing more of what’s right as it is about stopping what’s wrong. We have been talking about data from the beginning of this article. But you don’t need to use all the data for your SEO. The data you use is determined by what your goals are. Let’s focus on the data you need to analyze for your SEO. But before we get into the data, let’s talk about how to access this data. If you already know or have installed Google Analytics, you can skip this part of the guide. If you haven’t this part will cover signing up for Google Analytics and installing it on your site. You need to open a GA account if you do not have one. To do this, you need a Google account. Use an existing one or open one only for GA. Fill out your account name and then the website information. "Property" in Google Analytics refers to your website. The account and property names can be the same. The industry category is optional but may come in handy in your analysis. Choose the reporting timezone carefully. It should be where the company you are tracking the data for is located. It is advisable to leave the data sharing settings checked as you may need to use data from other Google tools like AdWords. Click get tracking and read and accept Google’s terms and conditions (which is GDPR-compliant). Copy the tracking code snippet and paste it into your website’s header. If you’ve got a WordPress site, we recommend using Yoast’s free SEO plugin to do this. When you view your page’s source code, you should be able to see the GA tracking code just above the closing header tag. 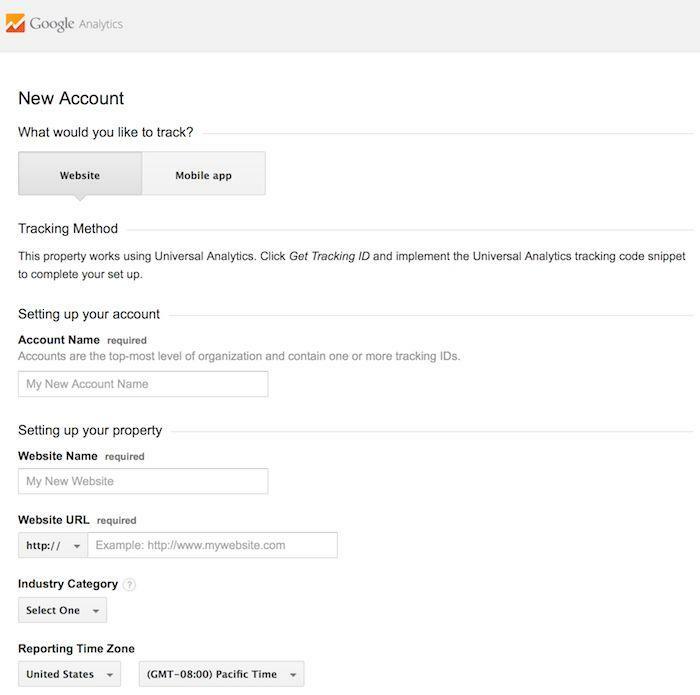 If you’re tracking Google Analytics for your own website, set up your account using your business’ Google account. If you’re optimizing someone else’s, set up Google Analytics using that business’ Google account. Then request they give you access to their analytics account. If you’re working with a larger team, you can give different people different levels of access to Google Analytics’ features. You may want to give one person access to only view reports while allowing another person to create their own dashboards. Now that you have a GA account that has been properly set up, let’s look at the data that matters to your SEO efforts. This data tracks the percentage of site visitors who arrive on a page and leave without taking any further action. With Google Analytics, you can see the bounce rate of individual pages as well as the pages with the highest and lowest bounce rates. Bounce rate in SEO is a bit of a touchy subject. For a long time, it was seen as a factor in a page’s Google rank — a high bounce rate drives down a page’s ranking. Especially if the user returns to the search results and picks another page (known as "pogo-sticking"). However, Googler John Mueller has come out and said they don’t really look at something like that for a page’s ranking. So, when looking at bounce rates, take into a page’s goal when evaluating if there’s an issue or not. If the goal is to have a user quickly find information and then leave, a high bounce rate isn’t necessarily a problem. If the page is meant to encourage a user action, a high bounce rate is a big problem. 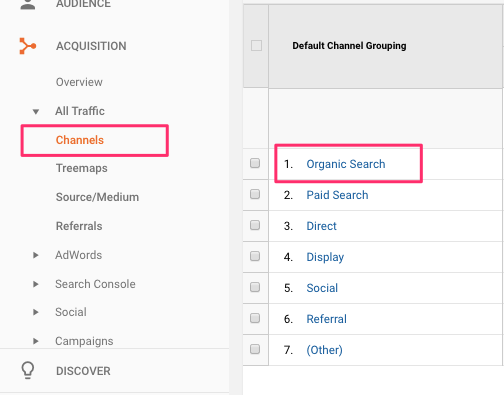 To access this data, go to acquisition, then all traffic, then channels. The traffic sources here will be segmented based on the channel (organic search, paid search advertising, direct traffic, etc.). Viewing visitors from the "Organic Search" channel grouping will show you how many users your site gets from search engines like Google and Bing. This report helps you identify the top landing pages for Google search, the top exit pages and how SEO traffic performs on your site. Tracking overall organic search traffic on your site can help you monitor your site’s overall health and fix issues that caused you to lose rankings. Here, you will get to see a breakdown of your website visitors by device – mobile, tablets or desktop. The pie chart icon will show the share of traffic your website gets from each type of user. If over 10% of your traffic comes from mobile, which is highly likely, then you need to ensure that your site is mobile friendly. The whole point of SEO is to get traffic onto your site that will help achieve your business goals. Setting up and tracking conversions are how you determine whether or not you’re successful or if you’re on track. Traffic source: See the value of your Google traffic compared to Facebook, email, direct or PPC campaigns. Page: What pages are the most valuable? Which are the least? If one page has a high conversion rate, start building campaigns around it to drive more traffic. Visitor device types: Are your mobile conversion rates much lower than your desktop rates? Again, you might have mobile friendliness issues in your conversion funnel if your site has lots of mobile visitors but no conversions. Page load time matters in SEO. It matters a lot. In fact, they released a ranking algorithm updated dedicated exclusively to page speed. It's known, creatively, as the Google Speed Update. You can look at the speed of individual pages and how they compare to your site average. Working to improve page speed will help improve not only search ranking, but also user experience and, potentially, conversions. There are people who believe that it could be likely that Google will tend to favor sites using its software. This claim is however not supported by any evidence. You can, in fact, test it yourself. Uninstall GA and use any other software to monitor your traffic and other SEO factors. You most likely won’t see any change to rankings. There are webmasters who insist that using GA will lead to penalizations by Google since they are able to access all your site’s data. This includes the pages you might have disallowed by robots.txt or the noindex meta robots tag, which it otherwise wouldn’t see on its own. However, Google doesn’t index or rank pages it doesn’t see. So even if Google did know about pages blocked in some way, they’ll never rank anyways. So it doesn’t really matter. So now that we’ve covered what analytics is, what Google Analytics can do for you and what role it plays in your search engine optimization, where do you go next? If you haven’t set up Google Analytics for your site, that’s your first step. Read Google’s installation guide for Google Analytics to get it done. For WooRank customers, sync your WooRank Project with your Google Analytics account to pull traffic and user behavior into your website’s Review. Take the Google Analytics Academy training lessons. These courses will teach you Google Analytics best practices and how to get the most insights from your analytics data.